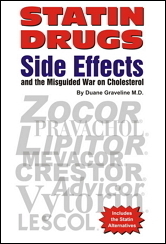 Personal Experiences with Statin Drugs. Free Online Cholesterol Converter and Triglyceride Converter. Convert Cholesterol numbers from US to UK, Canada, Australia. 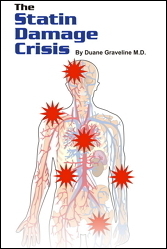 More than ten years ago, Dr. Duane Graveline began a series called My Statin Story. 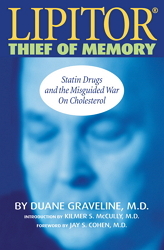 Over the years, he chronicled his experiences and struggles with his own statin-related issues that began in 1999. The consumption of hydrogenated fats, and partially hydrogenated soybean oil, can throw off the balance between prostacyclin (needed for blood flow) and thromboxane (needed for clotting) production in the body. 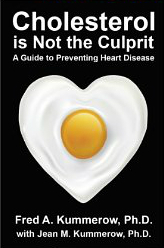 Fifty facts about statin drugs, cholesterol and heart disease. Many of these you may not be aware of. Mevalonate blockade of varying degrees is inevitable when statins are used. Although every cell in our bodies is affected by reductase inhibition, those cells having greater need of energy such as muscle and heart cells, kidney and liver will be affected more. The vital role of PQQ in mitochondrial support has only been documented in the past 15 years. 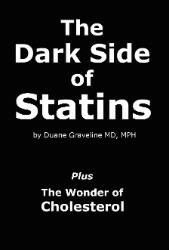 From what I have read of this substance, it is worth considering for those of us who have been damaged by statins, whether by cognitive dysfunction, permanent myopathy, ALS like symptoms, or peripheral neuropathy. There are problems with deep fat fried food that affect our nutrition. These problems occur because of chemical alterations in the fat that happen as a consequence of deep fat frying food. The longer the frying fat is heated, the greater the changes in that fat. Although PCSK9 inhibitors are not statins, they are designed to be used in conjunction with statins for those patients that do not experience the expected drop in LDL cholesterol from statins alone. The connection between statins, primary lateral sclerosis PLS, amyotrophic lateral sclerosis (ALS) and peripheral neuropathy (PN). Fructose, Sunscreen, Statins and Flu Shots: a Recipe for Alzheimer's Disease.